A speaker for the dead indeed. 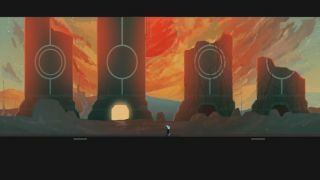 Boston developer Dejobaan's latest experimental game concept, Elegy for a Dead World , involves tales of forgotten civilizations and extinct societies, all filtered though the textual influence of British Romantic poetry, according to an interview with studio head Ichiro Lambe at Indie Games . The project is a collaboration between Dejobaan and Ziba Scott of Popcannibal . "You are a speaker for lost worlds," said Lambe "You investigate three long-dead civilizations. You report on who they were, what they did, and how they died." Elegy's premise rests on the experience players have traversing the landscapes of the game's three ancient societies, each inspired by the writing of the British Romantics John Keats, Lord Byron, and Percy Bysshe Shelley, according to Lambe. Whatever writing the players themselves come up with after they're done exploring can then be shared through the Steam Workshop. "And when you're done, you read other people's journals, playing the part of fellow researchers—storytellers—critics," Lambe said. "Is my interpretation of what happened in the world consistent with what you saw? Is it lyrical? Interesting? You give it your seal of approval or give it a pass, and my story is rated accordingly." And as the developer of games like AaaaaAAaaaAAAaaAAAAaAAAAA!!! for the Awesome , Dejobaan is certainly used to charting its own course. Currently an entrant in the 2014 Independent Games Fesitval, Elegy will be distributed though Steam, according to Lambe.